MacDonald Mines Exploration Ltd. announces that it has completed the previously announced airborne geophysical survey of its Wawa-Holdsworth Project, located 20 km northeast of Wawa, Ontario. Results indicate that the Oxide Sands continue along strike from the known surface exposures (see Figure 1). Quentin Yarie, MacDonald's President and CEO commented: "The magnetic survey successfully mapped the Oxide Sands along trend. Results indicate that they likely extend beyond what is currently defined and the upcoming EM survey will map their depth. This data will positively impact our upcoming trenching and drill programs by allowing us to focus our exploration efforts. Following the completion of the geophysical survey, we will undertake an expanded trenching program followed, shortly thereafter, by a drill program." An EM geophysical survey is scheduled to begin in early June. 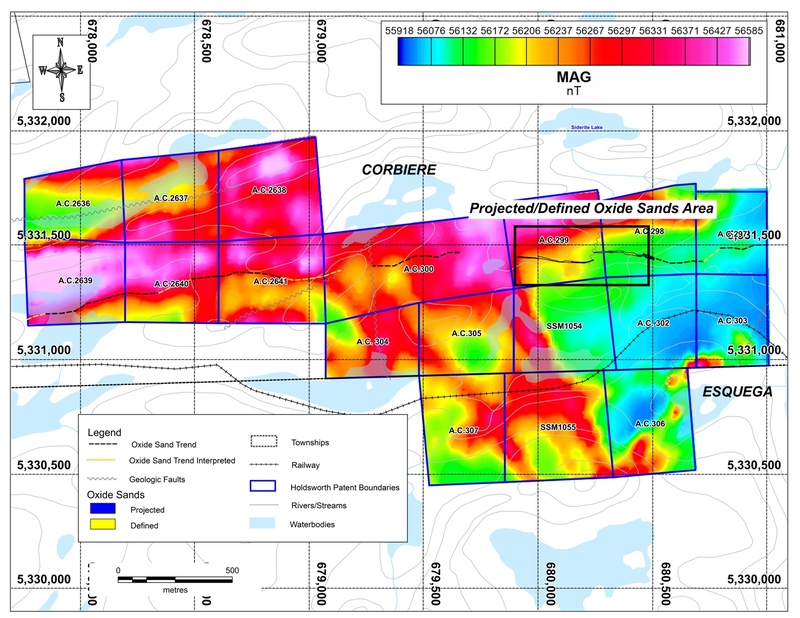 The EM survey has been designed to map the depth extent of the Oxide Sands and allow us to better understand the overall potential of the zone. MacDonald Mines is focusing its near-term exploration program on the Oxide Sands. These appear to extend for more than 2 kilometres on the property and reach a depth of at least 8 metres. Preliminary metallurgical testing conducted by previous operators on composite samples recovered, without crushing, between 69% and 98.7 % gold. Earlier this year, MacDonald Mines initiated in depth metallurgical testing of the Oxide Sands to achieve the highest possible gold and silver recovery. Results are expected this Fall.